The Keeneland project is a five-year Track 2D cooperative agreement awarded by the National Science Foundation (NSF) for the deployment of a high performance computing system with an innovative architecture. 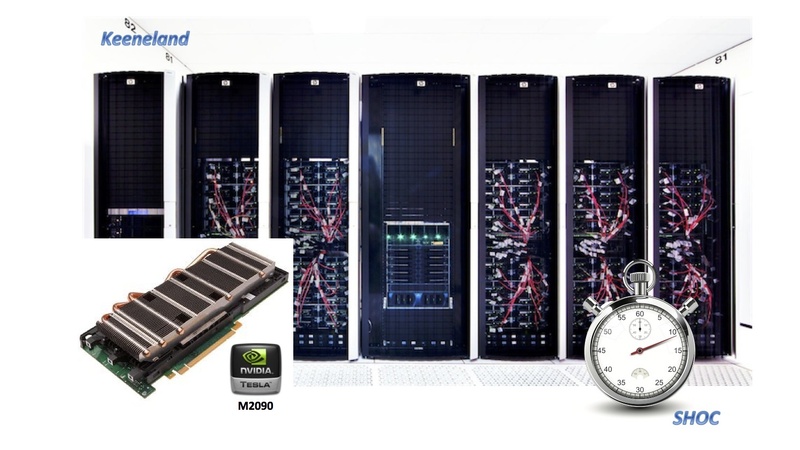 The Future Technologies Group (FTG) founded and led the NSF Keeneland Project from 2009 until 2015, bringing the emerging GPU architectures to the open science community. The Scalable HeterOgeneous Computing (SHOC) benchmark suite was developed to measure the performance and test the hardware of heterogeneous systems like the Keeneland clusters. SHOC has been developed and maintained by FTG researchers since 2010. Widely used by vendors, researchers, and for procurements worldwide, the initial SHOC paper has been cited over 175 times, and the SHOC software has been downloaded over 10,000 times. 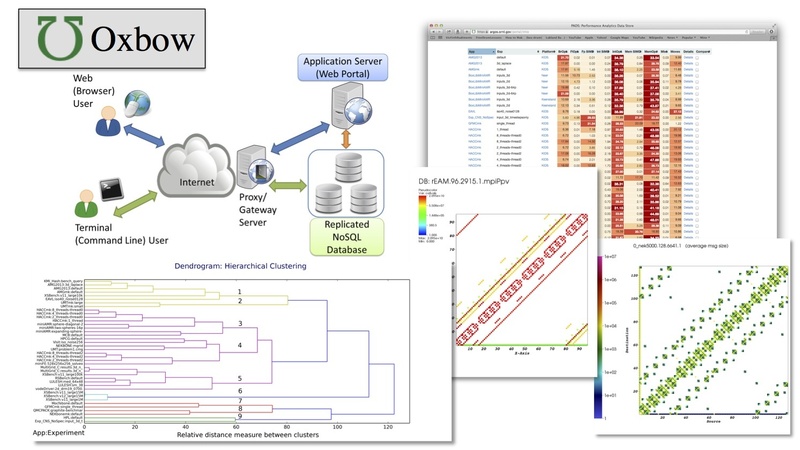 Oxbow is a collection of tools for characterizing the behavior of parallel applications. The toolkit includes programs to collect information about a program's instruction mix, memory accesses, and communication. We store the Oxbow data in PADS, the Performance Analytics Data Store. PADS provides an easy-to-use web interface for accessing data collected by the Oxbow tools in graphical or textual form, and for comparing the Oxbow data across different applications and systems. Aspen is a domain-specific language for analytical performance modeling which fills an important gap in existing performance modeling techniques and enables rapid exploration of new algorithms and architectures. Aspen contains a suite of tools for resource and performance queries, including synthetic program analysis, and its fast performance enables such use cases as feedback to runtime systems. Aspen models are modular and composable, and are thus easily shared. 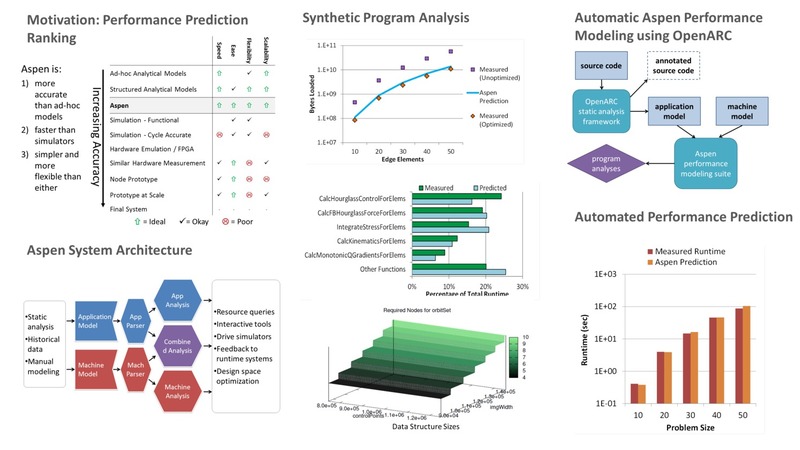 Application models for Aspen can be derived from historical data, manual modeling, and now through an automated static analysis framework implemented in OpenARC. OpenARC is an open-sourced, High-level Intermediate Representation (HIR)-based, extensible compiler framework. 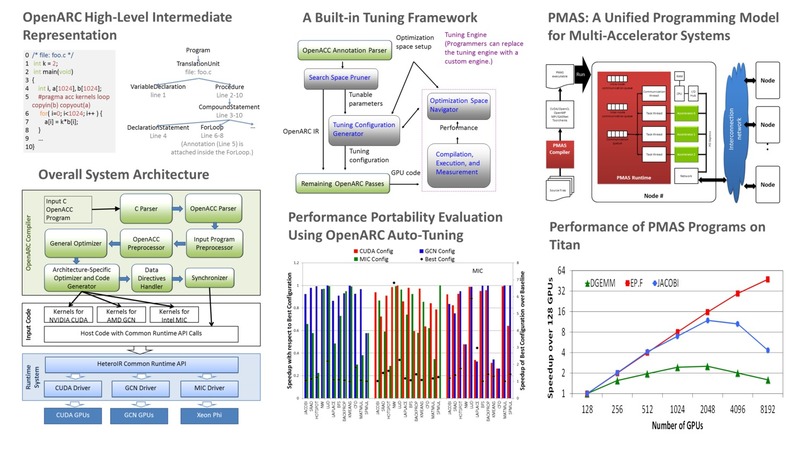 OpenARC provides a powerful research framework for various source-to-source translation and instrumentation experiments. OpenARC has the following salient features: 1) perform source-to-source translation from OpenACC C to architecture-independent, high-level representation (HeteroIR), 2) support CUDA/OpenCL back ends targeting NVIDIA/AMD GPUs and Intel MICs, 3) support full features of OpenACC V1.0 plus a subset of V2.0, 4) equipped with various advanced transformation passes and built-in tuning tools, and 5) AST-like synthetic view of the source program, easy to understand, access, and transform.